M-331 Three pen holders. Very light in weight, about 5 oz's each . 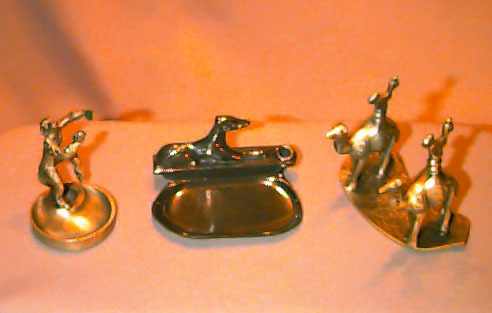 They are all made out of pewter and are quite nice. From left to right there is a gorilla, a dog (greyhound), and two camels, all ready to hold your pens. The prices are, $75.00 for the dog, $75.00 for the monkey and $90.00 for the camels. If you'd like all three of them $220.00 is the price. These are not antique - they are new.